Notice his perfect form? Believe me, it came at a high price. 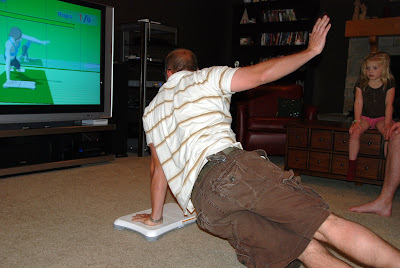 The poor Wii was called many names by the time our fit friend had completed his 6 push-ups and side planks. 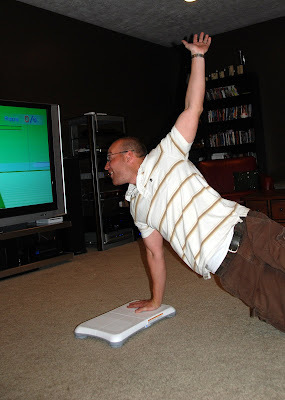 As it turned out, Tyler's Wii Fit age was 43. Maybe he needs to add more protein to his diet. About Justin's form, hmmm, let's talk. Okay, let's not. 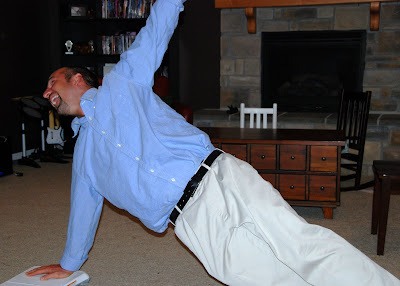 Just keep in mind, his Wii Fit age was 50! 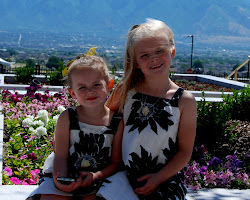 Oh goodness, what old friends we have. After several reps, he was able to improve his form and managed to score higher than Tyler did with his "perfect" form. Our apologies to their wives, Kim and Michelle, for keeping them out well past the kids bedtimes, but we HAD to be home taught. I saw this on TV last week! Looks like fun!